A successful screen writer is on holiday in Paris with his girlfriend and her parents. He's trying to switch to writing novels to fully express his talents. One night he accepts a lift in an old car and is transported back in time to the 1920s, where he meets a whole host of legendary art figures. 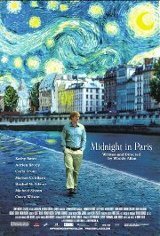 He enjoys it so much that he goes back the next night, makes friends with one of Pablo Picasso's mistresses, and then has to decide whether to stay happily with her, or return to his own troubled present-day life.